Written by The Vanilla Queen! Chock-full of delicious recipes and culinary tips for using pure vanilla. The Vanilla Chef is out of print, but we located some digitally-printed copies and recommend that you grab one while you can! 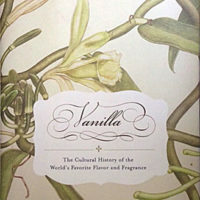 Written by Patricia Rain, Vanilla Queen, The Vanilla Chef contains 190 pages filled with fascinating information about this unique and mysterious flavor of the Americas. More than 130 recipes and an abundance of tips will entice you with delicious and unusual ways to use vanilla in traditional favorites such as ice cream and cookies, as well as in specialties not commonly associated with vanilla’s sweet flavor and fragrance. Mouth-watering delicacies such as Vanilla Mojitos, Salmon in a Rum Curry Vanilla Sauce, Seared Muscovy Duck Breast with an Orange Vanilla Glaze, Vanilla-Honey Chipotle Salsa, Vanilla Pots de Crème, and Homemade Marshmallows, encourage readers to reconsider that little brown bottle in the cupboard, and to experience the magic it contains in new and fanciful ways. A great price for a terrific book! Buy your copy now!